Tomorrow is my daughter's 18th birthday! She requested this little orange, creamy dessert! It has become a family favorite. Though the recipe calls for it to be a layer cake, I do not have the space in my refrigerator to keep such a tall cake in, plus it slides and falls apart if someone opens the fridge without due caution! So I turned it into a "tear it up in pieces, layer the cake with orange cream kind of cake". It still tastes delicious! Once cooled, punch holes all over the cake. I used the end of a spoon to make holes. Mix 1 small package of orange jello with 1 C boiling water. Mix to dissolve. Then add 1 C cold water. Stir. Pour into holes and over top of cake. Then take 1 small package of vanilla pudding and mix with 1 C whole milk. To this, add 1 small package of orange jello. Stir to mix well. Fold in 1 large tub of Cool Whip (16 oz). Do not stir. Put a large dollop of the pudding/jello/cool whip mixture in the bottom of a trifle dish. Take 1/4 cake and break into bite sized pieces. Place cake pieces in the dish with some orange showing towards the outside of the dish. Cover the cake pieces completely with the pudding/jello/cool whip mixture. Repeat until all cake is used and end with layer of pudding/jello/cool whip. I sprinkled 1/2 tsp of an additional package of jello mix (dry) on top to get some darker orange color and this can be done between layers as well... I garnished with orange fruit candies. Not being sure if everyone coming tonight liked orange, I decided to bake a chocolate cake too and frosted it with a homemade white frosting to which I added some seedless raspberry jam to add color and flavor. This was actually pretty and yummy too! I garnished the cake with frozen raspberries and then placed frozen mixed berries around the platter. Close-up of the berries. My daughter and I love berries! With a couple sprigs of mint leaves, it looked really pretty! No special recipe for this. Bake any devil's food cake, make white frosting, add seedless, raspberry jam. After frosting the cake, melt baking chocolate on the stove with a spoonful of butter or shortening and then drizzle over the top of the frosted cake. Garnish with fresh or frozen berries. I did try small amounts of each cake. Both were delicious! Best of all, both were SO easy to prepare! Try it, you will like it! Linking this to The Checkered Apple's Summer Dessert Link Party! Stop by to say hi to Diane, and check out some summer dessert recipies! Better yet, leave a link to your favorite summer recipe posted on your blog! The color of my most recent sewing project seems appropriate for the extremely high temperatures we have been experiencing for a few weeks here in New Hampshire....this girl has been on fire! ...and not in a good way! I love summer. Don't get me wrong! But the heat and humidity are not my friends. They just don't agree with me. I am both happy and relieved to report that the heat will become less extreme beginning tomorrow. I cannot wait! I am going to open every window in the house. I love temperatures in the high 70's and low 80's and zero humidity! I sat out on my very hot porch today and finished sewing this little batik wristlet. I could not even sew in a straight line. Seriously! This is a practice project. I am making up the pattern pieces as I go. The finished bag is approximately 6"x8" and self-lined. I made the wrist strap a bit longer and attached a little bow. Anyways, another project completed... Tonight we are expecting storms ahead of the approaching cold front. I say, "bring on the rain!" Hope you are cool wherever you happen to be! "Reds, yellows and oranges conjure up sunlight and fire, while the blues and blue-greens evoke snow and ice, sea, sky and moonlight." 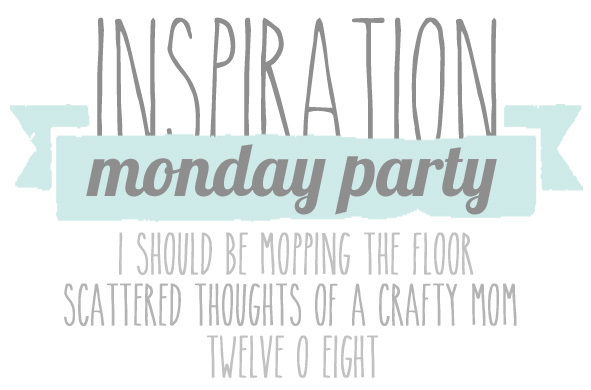 twelveoeight's Inspiration Monday Party, Click HERE! This was a busy day and a hot and humid one at that! Luckily I got to spend some time today chilling at an ice rink! Tomorrow is supposed to be even hotter and more humid! I worked on some more angels today....I finished this one! She's cute. Tied on to a pair of candlesticks, she would make a nice hostess gift for the holidays. or there....she adds some country charm wherever you place her. Started a few more angels too! Here they are lined up on my ironing board. They haven't earned their wings yet....soon though! They are a great way to use up fabric scraps and lace. I plan to make my next batch of angels out of white and cream colored fabrics. I admit they have become my latest obsession. They are very fun to make, can be completed quickly and can be personalized for a thoughtful gift. I promise that this will be my last angel post for a while. Speaking of angels, below is my furry angel, my beautiful girl Ellie! She was rescued in the South and brought North. We found out that she was heartworm positive even though she tested negative prior to her arrival in December. It can take six months to test positive. She has had a rough day. Prior to heading to the rink this morning, I dropped her off at the vets. She began the injection portion of her heartworm treatment today. I picked her up this afternoon and she has not been feeling well. Her activity will have to be restricted for the next several weeks. In this photo which was taken a couple of days ago, I was in the middle of a photo shootand she jumped up and sprawled out on my crocheted table cloth! Ahhhh! She likes to be in the middle of my business at all times. I love her to pieces! She is a sweet dog and I am so glad we were able to adopt her! I am hoping she does not suffer any complications during her treatment. PAWSitive thoughts for Ellie please! That's all for now! I will be sleeping with the dog tonight as she seems to be uncomfortable and a bit restless. "Believers--look up, take courage. The angels are nearer than you think." Another Angel Got Her Wings! My newest little angel....she just earned her wings about an hour ago! 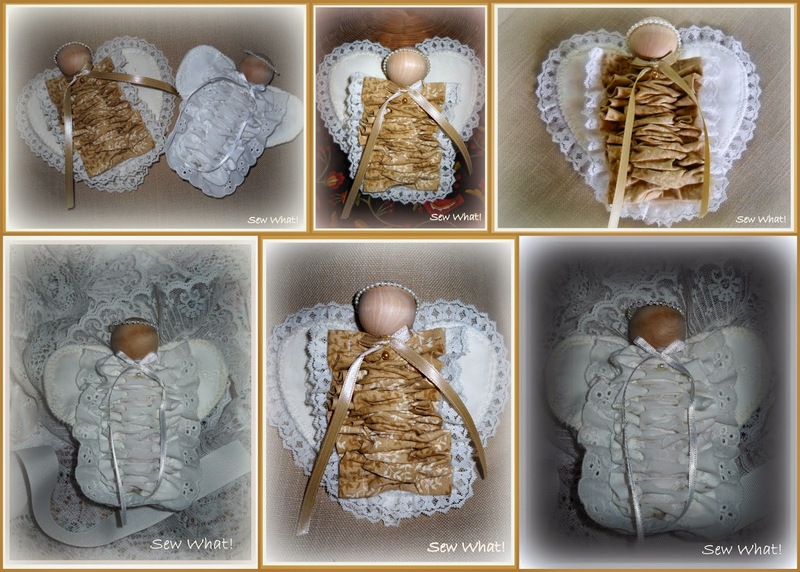 I spent yesterday trying to figure out how to make my angels that I originally had made from recycled curtains (see yesterday's post HERE ). Today I really wanted to tweak the wings and determine and cut actual pattern pieces so I decided to pull out some fabric scraps. After seeing her completed (my little angel above) I know that I can use any fabric and use a multitude of embellishments and I can actually stray from white and cream colored fabrics and still create something that resembles a little cherub! I love her! She is very cute! I like the lace around the wings.... and the rough zig-zag stitching. Here they are together....the second one was so much fun to create! The first one, well, I nearly hurled my sewing machine out the porch window because it was giving me trouble. I cannot wait to make some more of these little cherubs! Heading to Joanne's to get some spanish moss to try adding some hair. I imagine that soon I will have an entire choir of these little angels! I will keep you posted. Another Angel Update: Three's a Charm! The angel (below) has 2 rows of lace edging around the wings. ....and then there were three. The Thrifty Groove's Thrifty Things Friday Click HERE! Common Ground's Be Inspired #148 Click HERE! Hickory Trail's Effort and Assets Linky Party #10 Click HERE! A Cat-Like Curiosity's Super Handmade Sunday, Click HERE! Family Home and Life's Say It Saturday, Click HERE! My Turn for Us Freedom Friday's #62, Click HERE! Life on Lakeshore Drive's The Bouquet of Talent Linky Party #44, Click HERE! 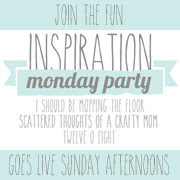 Scattered Thoughts of a Crafty Mom's Inspiration Monday Party, Click HERE! It's raining.....again. We've got a little bit of lightning and thunder too. My afternoon goal has been trying to come up with a prototype for an angel that I had posted HERE that was made from recycled curtains. Let me tell you, it was a whole lot easier making her from old curtains than from scratch! But I plugged away, trying numerous ways to construct the wings, etc. With Christmas only a little more than five months away, I want to start early on ornaments and gifts. Here is the angel I have been working on this afternoon: she has a pearlised beaded halo, padded wings but no hair, yet. She is looking a tad bald...shall I add the hair or not? That is the question! Remember, this is just the "rough draft." She is pretty cute, I think. Her body is a clothespin. (not the clip type) Her dress is a tube about 14" long, shirred over the clothespin and glued in place. I sewed a channel on each side to produce the ruffle on each side. Then 3/4" eyelet lace was glued around the three sides of the dress. Her wings are a top layer of eyelet, a piece of felt and white cotton fabric for the back. Now, does she need hair? "Ever felt an angel's breath in the gentle breeze? A teardrop in the falling rain? Hear a whisper amongst the rustle of leaves? Or been kissed by a lone snowflake? Nature is a angel's favorite hiding place." Check out this angel update: Click HERE! The Shabby Creek Cottage's Transformation Thursday #212 Click HERE! visit the party and check out some crafty links! Shabby Art Boutique's Shabbilicious Friday Party, Click HERE! Please visit some of the links....going back myself to check them out!